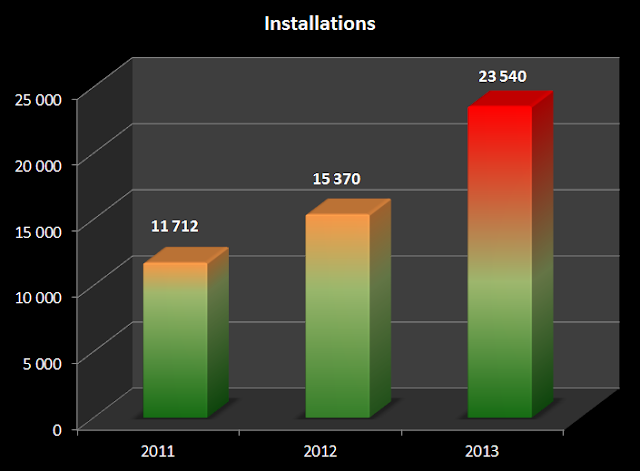 Since those numbers have grown tremendously, I decided to log every install request. Sadly I do not have the data from the beginning in 2009, only from 2011 onwards. As you can see, in 2013 there was an explosion of installations, one of the reasons I did not have that much time for CCNet. I just hope this year the amount of installations is lower again. We now have about 110 customers, so that's about seven times as much as back in 2009 ! 5 programs, and only used a WPF front end, WCF services and a database. And these had to be installed at 15 of our customers, meaning actually doing 75 installations. Manual installation of 1 program took 20 minutes so this meant 75 * 20 = 1500 minutes which equals to 25 hours. So a good 3 days of work just installing ! And some customers use Terminal Services, which means they do not want to use click-once, but just xcopy deployment. Meaning all the assemblies of the front-end must be copied to a share on the terminal server(s). Yes that is plural, we even a a customer that has 26 Terminal Servers ! All that maintenance per server is also done via CCNet. Installing a new version at a customer is very easy, upload the files to an ftp server, update and upload the customers CCNet.config. This is an total of 15370 installations ! The new way took me 4010 minutes which is 66 hours or a week and a half. And this is totally automatically, so no errors done on replacing settings and the like. And because there are only 52 weeks in a year, .... this is a HUGE timesaver. It's been a while, but I'm back. Now focusing on getting 1.7 out of the door, due end of June 2012. Nant : newline in causes "Target ' ' does not exist in this projechttp://www.blogger.com/img/blank.gift." In this post I'll describe how one can set up CCNet to work with VS2010. Not everyone has the full blown version of TFS at their disposal. Project_QA : this does unit-test, integration_test, coverage and code analysis. This is a pragmatic approach: a 'fix' can be deployed even when for example coverage is still below X percent, as long as all tests are passed. It's convention that QA must be fixed ASAP! The CI must be as fast as possible, so it runs only the unit-tests. The CI project has an interval trigger checking the repo every 5 minutes. This project does NOT label TFS. The makePackage project has a schedule trigger : every day at 20:00, and a labeler so we can easily branch via a label. The QA project also has a schedule trigger : every day at 21:00. This project does NOT label TFS. This allows for easy branching. I use the pre-processor to reduce a lot of the configuration. This allows me to define a CCNet project in just 30 lines! My advise : set the deleteworkspace and cleancopy to true, this prevents a lot of problems. A full example of ccnet.config with comparable layout is at the bottom of this post. The main action lays of course in the build script, for which I use Nant. The reason I (still) use Nant is that I know it rather well, and it works. For compiling I just call the MSBuild task from NantContrib pointing to the VS2010 solution, but all other logic is in Nant. An example of the Nant build script is also at the bottom of this post. In Ms-test you can specify that you also want coverage to run, see for setting it up. with a specific base name(cover_me) and no timestamps appended. Just to make things easier for me. I've added 2 new xsl files (MsTestReport2010.xsl and MsTest2010Cover.xsl) to CCNet, you can use these in the dashboard in the build plugins. with the following NamingScheme : baseName="cover_me" appendTimeStamp="false" useDefault="false"